Euro continues growing up; yesterday the bulls broke the maximum. 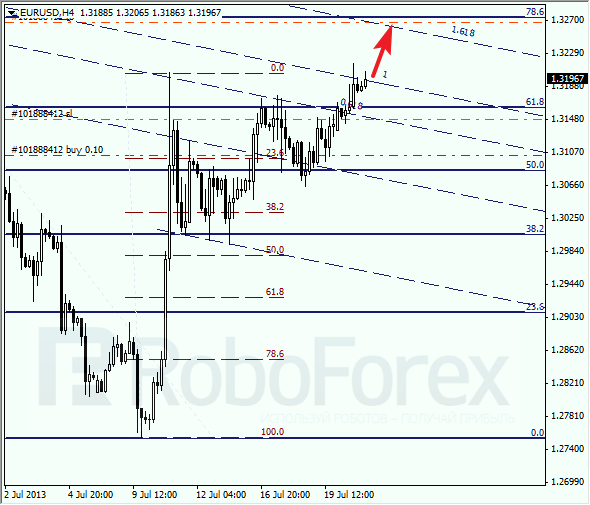 The main target is at the level of 78.6% and the 1.618 line of the fibo-channel. If the pair rebounds from these levels, the price will start a new, deeper correction. At the H1 chart we can see, that the price is moving above the level of 61.8%. Apart from the level 78.6%, there are several more fibo-levels in the target area. According to the analysis of the temporary fibo-zones, the predicted targets may be reached during the day. Franc is moving downwards. After breaking the minimum, the market started a correction, but may begin a new descending movement during the day. The target for the bears is at the level of 78.6%. The stop on my sell order is placed at the local maximum. At the H1 chart, the pair is moving below the level of 61.8%. According to the analysis of the temporary fibo-zones, the targets may be reached within the next several hours. If later the price rebounds from level of 78.6%, the bulls may start a new correction.